You'd never believe that this one is vegan. It tastes—not unappealingly—like there might be a stick of butter in there, and in that respect will be a perfect addition to whatever you stuff your face with this weekend. For variety, you might want to add some roasted chestnuts before you puree the soup, or stir in some chopped greens like spinach, chard, or kale at the end. Roast the squash: Rub about a teaspoon of olive oil all over the skin and the flesh of the squash, then place it face down on a baking sheet (foil-lined, if you'd like). Roast for 15 minutes, flip it over and roast it for 10 minutes, and turn it face down for about another 15 minutes. It will be done when you can effortlessly skewer it with a knife. Cool until safe to handle, then scoop out the seeds, trim off the skin, and roughly chop. Heat the oil in a soup pot over medium heat. Add the shallots and fry until almost translucent, then add the garlic, carrots, bay leaf, and squash, tossing to combine. Cover the pot for three minutes, which will allow everything to steam and sweat and release its goodness. Pour in the stock, covering by about 3/4". Bring to a boil, then simmer for 20 minutes or so, until everything is tender. 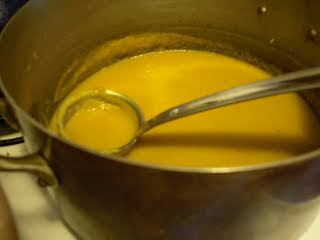 REMOVE THE BAY LEAF and then puree the soup either with an immersion blender, in batches in a regular blender or food processor, or through a food mill (it best pureed, otherwise I'd list here an option to mush it up with a potato masher). Add salt, pepper, and lemon, adjusting seasonings however you see fit, and serve.